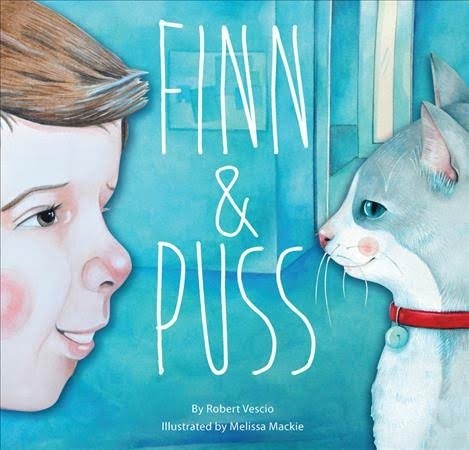 Prolific picture-book author Robert Vescio has a brand new title, Finn and Puss, which was just released by EK Books (you can read my review of it here), and was kind enough to agree to an interview with me. Finn and Puss is a tender tale that explores ethics and integrity. It is a story about friendship between a lonely boy and a lost cat. It also touches on themes of hope, despair, loneliness and how sometimes we need to make hard choices but that ‘doing the right thing’ has its own rewards. The story was sparked by a similar situation that my children were faced with. They were the inspiration for this story. I was very proud of their decision. And so, the seed that had been sewn in my head took root and a story began to grow. I quickly put pen to paper and wrote this story to help other children who are faced with the choice between right and wrong. My children may not have received the same reward that Finn receives in the story but just the satisfaction of knowing in their heart that they did the right thing was reward enough for them. Finn and Puss is a story that matters. Children need to know that finders are not keepers. Things, including pets, belong to someone. And when you find them you seek their real owners, especially if the identification is right there in front of you. Doing the right thing shows that you are honest, responsible and truthful. By teaching our children to do what is right and not what is easy, they will grow up to make a difference and become great leaders. Finn used good judgement in his decision to return Puss back to its rightful owner. When you think things through you’ll make better choices and you’ll gain the trust of your family and friends. Have your child/ students list ideas about ways to tell whether or not something is the right thing to do. Role play a situation at home/in class. Ask your child/students to talk about a time when someone tried to get them to do something wrong. What did they do? My favourite picture book is Lost and Found by Oliver Jeffers. Oliver lives in a child’s mind and thinks out each scene with so much depth that children are easily engaged. Children can see themselves as the boy in the story. I know my children were hoping one day a penguin would arrive at our doorstep too. Also, the illustrations bring the story to life with so much emotion and personality. It’s just a beautiful book, overall. I think the world, the every day and my own experiences help shape my writing. I’ve said it before – ‘write what you know.’ If something is very close and dear to your heart the words will flow out easily. This will help you find your voice. Unlock your heart. Remember, only you can write the story that is yours to write. I spent most of my working years in the publishing industry as a Production Manager and as a Photo Editor at Studio Magazines. I worked on many titles but it was Studio Bambini magazine that really propelled me to start writing for kids. It was like being a kid in a candy shop, except picture books were one of the main attractions. I started sampling the candy. And, it was delicious! So my love affair with picture books grew from strength to strength. And the rest is history. Aim for different. Think of something close to your heart and make it interesting. Be creative! It’s all about creating a wonderful experience for your reader. Make your reader pause and pay attention. See your vision. Capture it. Write it! It all comes down to hard work. If you put in the hard yards, you’ll reap in the rewards. Pretend. It’s a word loved by children and grown-ups – a word that will always be part of us throughout our entire lives. As my family grows, this word will grow with them. I can’t wait to watch my children carry this word with them as their own families grow. Pretending is a way of life. It will always come back full circle – a cycle that will never stop until we cease to pretend. BIO: Robert Vescio is a self-confessed hoarder of books, especially children’s books. He enjoys writing stories and sharing his passion with children of all ages. His picture books include, Finn and Puss - October, 2017 (EK Books), Eric Finds A Way (Wombat Books), Ella Saw The Tree (Big Sky Publishing), Jack and Mia (Wombat Books) listed on the NSW Premier’s Reading Challenge for 2017, Barnaby and the Lost Treasure of Bunnyville (Big Sky Publishing), Marlo Can Fly (Wombat Books) listed on the NSW Premier’s Reading Challenge for 2015, No Matter Who We’re With (IP Kidz). Robert has more picture books due to be released in 2018 and 2019. Many of his short stories have been published in anothologies such as Packed Lunch, Short and Twisted, Charms Vol 1 and The Toy Chest and The School Magazine NSW. He has won awards for his children’s writing including First Place in the 2012 Marshall Allan Hill Children’s Writing Competition and Highly Commended in the 2011 Marshall Allan Hill Children’s Writing Competition.